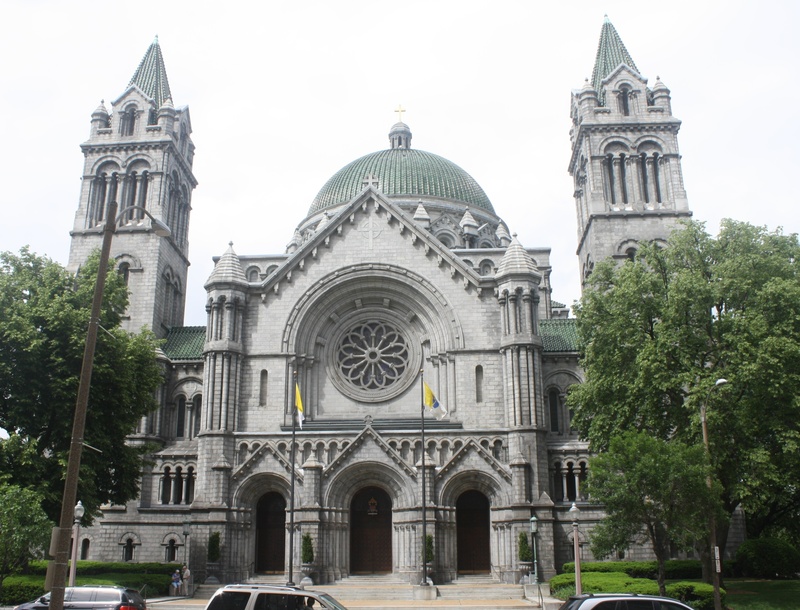 The Cathedral Basilica of St. Louis is one of the city’s most impressive sites. I turned around, startled by the voice behind me. A beatific nun, dressed in black habit, smiled at me. I wasn’t sure what she meant. I was very happy to be here, in the narthex of the Cathedral Basilica of St. Louis, but I didn’t think I was euphoric enough to be emitting light. And I certainly wasn’t pregnant. What was she getting at? She nodded toward the camera in my hand. “Enjoy your visit,” she said before silently passing through the door into the chancel. The golden barrel vaulted ceiling greets you as soon as you step inside. Puzzled, I tried to figure out why I might be glowing. I had been in Missouri for a couple of days now, and although I’m always thrilled to be in a new place, I didn’t think that was radiating out of me. I had just finished a short drive along Lindell Boulevard, impressed by the mansions lining the street across from Forest Park — a serious reminder of the wealth accumulated in St. Louis during its heyday as America’s fourth-largest city, decades before it lost more than 50 percent of its population and plummeted to #58. The cathedral was another product of all that prosperity, and as I admired the façade, it was easy to see that the money had been well spent. 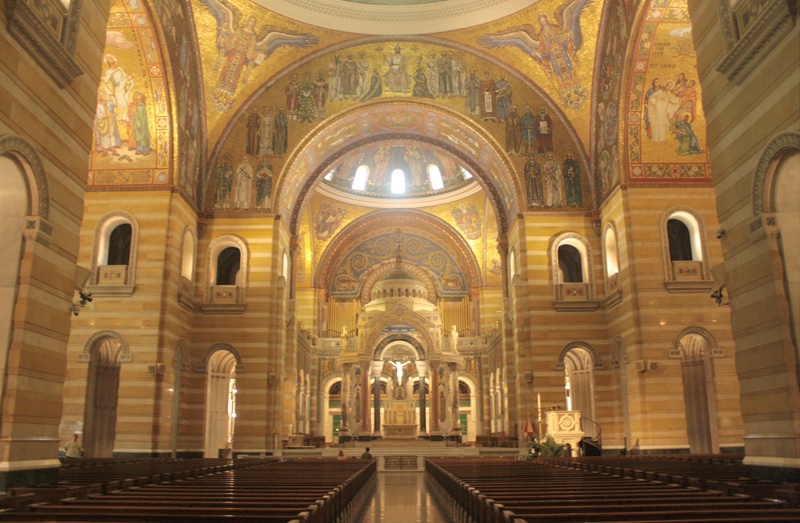 Begun in 1907, the massive building took seven years to complete, but the interior wasn’t finished until 1998 — one year after Pope John Paul II designated it a basilica. 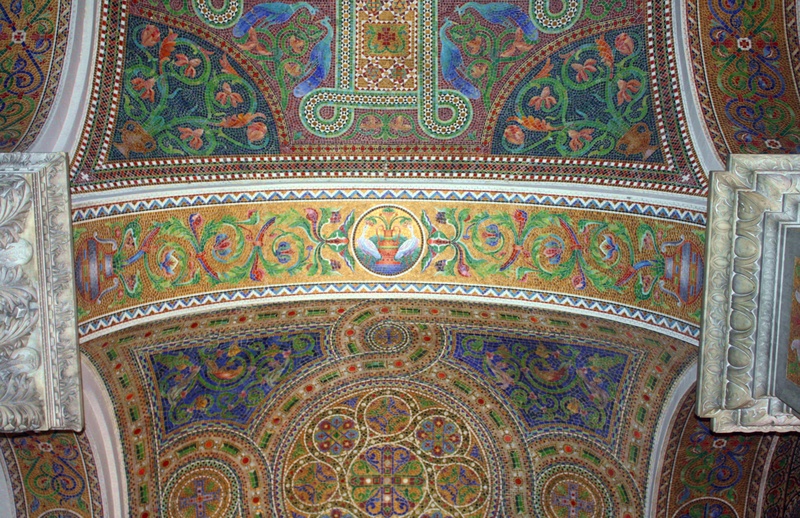 Occupying a generous corner lot on Lindell Boulevard, the basilica’s gray granite walls, twin towers, rose window, massive central dome covered in glittering green tiles, and trio of recessed arches practically commanded me to come inside. As I entered the chancel, I lost track of the nun, startled by what greeted me. The basilica’s Romanesque exterior belies the Byzantine interior, and I felt like I had stepped back in time by a millennium or so and ended up in an Asia Minor fantasy rather than in the heart of an urban area in the U.S. Midwest. Visually jarred, I tried to pick a focal point but quickly found it impossible. It wasn’t necessarily the pure white marble statue of Christ in the sanctuary, or the tremendous baldacchino topped by a dome that duplicates the one I had seen outside, or the myriad types of columns, or the elaborate artwork on the dome interiors more than one hundred feet above me. But then I settled on it — it was the 83,000 square feet of 41.5 million pieces of glass tessarae in more than 7,000 different colors surrounding me. In the record books, it’s the largest collection of mosaics in the world. In person, it’s one of the most luxurious spaces I had ever seen. I was sure that, at that moment, I was, indeed, glowing. A Byzantine delight in the heart of the U.S. Midwest. Twenty artists toiled for 75 years to create this mosaic masterpiece that astounded me in its beauty and detail; even Tiffany’s of New York had a hand in it. Throughout the entire basilica — in the chapels, transepts, ambulatory, and apse; on the walls, ceiling, spandrels, arches, and lunettes — religious scenes and symbols vied for my attention. There’s Jonah, rising from the whale, and Lazarus, rising from the dead. Moses holds his tablets of commandments, Noah holds a dove, and John the Baptist holds his own decapitated head in his hands. Mary’s entire life is displayed in vibrant colors. The Last Supper and the Final Judgment, with condemned souls passing through cold, loveless ice, are gripping. Apostles, angels, lilies, pelicans, chalices, lambs, palms, and the alpha and omega abound. Everywhere you look — even up at the underside of an arch — you’ll find mosaic masterpieces. But not every depiction is Biblical. The mosaic artists added plenty of contemporary events and people to complement those of the Old and New Testaments: The works of the St. Vincent de Paul Society, of the St. Louis mission in Bolivia, and of Joseph Cardinal Ritter in desegregating parochial schools in St. Louis; American saints Mother Cabrini, Elizabeth Seton, Rose Philippine Duchesne, and Isaac Jogues; and key milestones in the history of the Catholic church in St. Louis (e.g., first mass, first baptism) are all represented. More than an hour later, I found the nun, sitting in silent prayer in the All Souls Chapel. I didn’t want to disturb her conversation with God to tell her that I had most definitely enjoyed my visit. Rather, I returned to the narthex and took notice of what I had missed when she first spoke to me. 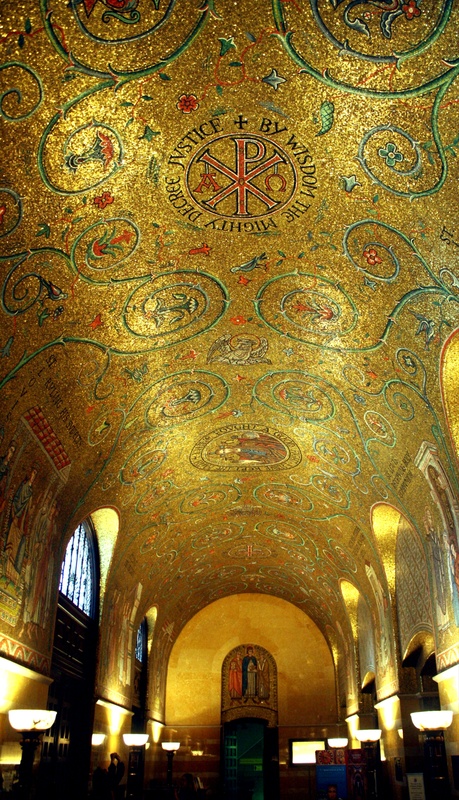 The lower wall of buff marble to symbolize earth leads up to a barrel vaulted ceiling covered from end to end in gold mosaic tiles, accented by a swirling green vine, representing Christ; symbols of the Four Evangelists; and various scenes from the life of King Louis IX (“St. Lovis With His Mother Blessed Blanche of Castile”; “St. Lovis Relieving the Needy”; “St. Lovis Fovnds the Sorbonne”). 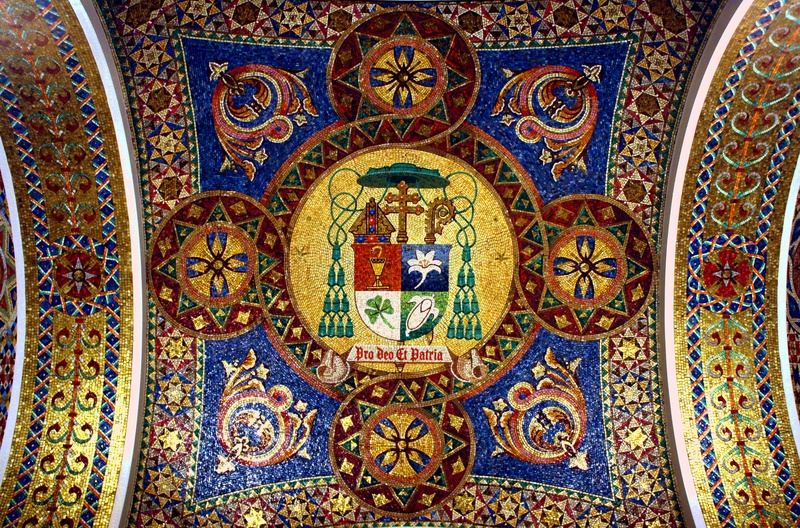 Just a tiny section of the 41.5 million mosaic tiles adorning the basilica. As I prepared to leave, a couple entered, and I grinned when their jaws immediately dropped. She uttered an elongated “Oooooh,” and he managed a breathless “Wow!” Then I noticed that they were bathed in the golden light being reflected off the ceiling down onto them. We caught each other’s eye and smiled. That’s beautiful, reminds me of Ravenna, didn’t know there anything like that in the U.S. I know of the mosaics in Ravenna, but the ones in Missouri came as a surprise to me, too. Hope you get to see them one day!